Apple has taken down its OS X Downloads page, ushering out one more piece of the non-Mac-App-Store direct download era, reports Macstories. The page, which hosted links to Mac downloads and software for OS X, free of charge to developers, was slated for removal by Apple late last year. The page, hosted at apple.com/downloads, was a huge driver of traffic for Mac software downloads and provided a central location for Mac users looking for quality software to go and browse. Now, the link has been replaced with a splash page for the Mac App Store, along with links to iOS Software Updates, Safari Extensions, Mac Software Updates, Safari 5 and iTunes 10. The widgets page is still up and running here, for now. This move is consistent with Apple’s new digital delivery policies as they move to codify all Mac software into the Mac App Store. While the Software Update menu remains in OS X Lion so far, it is completely conceivable to see a future where almost all software being installed on Macs passes through Apple’s store. Developers whose apps were featured on this page are likely to see a drop in traffic as a result. And, if they’re not also present in the Mac App Store, will now have much more difficult time helping users to discover their apps. It’s also worth noting that downloads from the Software Downloads page were not subject to the 30% cut that Apple takes from all Mac App Store purchases. The Mac App Store has already supplanted retail boxes for Apple’s next release of its system software OS X Lion and become the only way that users are able to upgrade to the latest version. 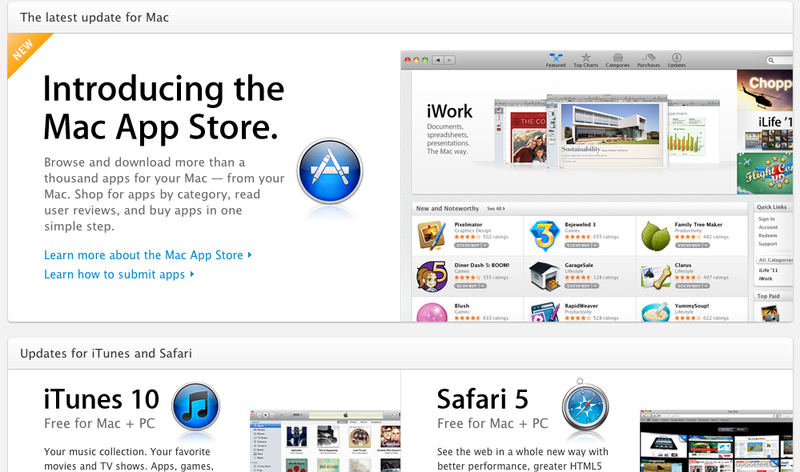 Whatever Apple’s plans for the future of the Mac App Store are, they’re deadly serious about it.